﻿ Grand Baie Suites Pulau Mauritius. JIMAT di Agoda.com! Ada soalan mengenai Grand Baie Suites? Jika apa yang anda cari adalah hotel dengan lokasi menyenangkan di Pulau Mauritius, cuma perlu lihat Grand Baie Suites. Dari sini, tetamu boleh menikmati akses mudah kepada semua yang bandar meriah ini boleh tawarkan. Untuk pilihan bersiar-siar dan tempat daya tarikan tempatan, pelancong tidak perlu pergi jauh dari hotel kerana ianya berdekatan dengan Shiv Kalyan Vath Mandir, Captain Nemo's Undersea Walk, Northview Tours. Di Grand Baie Suites, segala usaha dilakukan untuk membuatkan tetamu berasa selesa. Oleh yang demikian, hotel ini menyediakan perkhidmatan dan kemudahan yang terbaik. Untuk keselesaan dan kemudahan tetamu, hotel ini menawarkan meja depan 24 jam, simpanan bagasi, Wi-Fi di tempat awam, tempat letak kereta, pengangkutan lapangan terbang. Semua penginapan bagi tetamu menawarkan kemudahan yang difikirkan dengan teliti bagi memastikan rasa selesa yang sukar ditandingi. Hotel ini menawarkan banyak peluang rekreasi yang unik seperti kolam renang terbuka, memancing, kolam renang (kanak-kanak), taman. Nikmati perkhidmatan yang sukar ditandingi dan lokasi benar-benar berprestij di Grand Baie Suites. Bayaran pengangkutan lapangan terbang akan dikutip untuk satu hala. The staaf is really kind and even allowed us a late check out. The accomodation is clean and good equipped also for cooking. The furniture could be renewed in the near future. The pool is really nice. La Cuvette Beach is in walking distance and nice, but our favorite is Trou aux biches, which is a 15min drive. I do recommend to stay, it was really a pleasure. This hotel is surprisingly modern, clean and affordable. It is located 10 minutes walk from La Cuvette public beach, which is nice. Hotel provides full kitchen and a supermarket is next to the hotel, which is very convenient. Highly recommend this place, if you are staying here (and I recommend you do) can you please feed the stray Puppies and her Mum Living on the street outside the Supermarket next door, so sad and under nourished. Great stay. Extremely accommodating staff. Clean and functional studios/pool. Good location with groceries and restaurants easily accessible. Later checkout can be arranged if room available otherwise baggage storage not a problem whilst you’re out or continue enjoying the pool and shower facilities still possible to freshen up before you leave. Price and location are good. But when I back to hotel the second day, the sofa in living is missing! and when I check with the front door, she said the boss took it away. the explanation, it's a sofa bed,and we only are one couple, no need for this!! without any prior notice and then took away our sofa. where we sit? on the ground? Anyway, I didn't recommend this hotel except only you care is the price. really nice location, place in good condition with new style decor. staff very lazy but if you don't need anything then you'll be all good. but Grand baie is not the best place in Mauritius, go to flic en flac... way better Beach and alot more things to do! This is a laid back place which is made up of a bunch of individual bungalows. Each bungalow is roomy. Don't expect luxury though. The bungalows are a little on the old side and are not the best maintained--several of the windows in the place I stayed did not open properly. Some of them had cracks in them. Also, there's no air conditioning. This isn't a huge problem, except that coming from a desert environment, I'm sensitive to high humidity and so I found it a little uncomfortable at times. The restaurant is good but expensive, even by Seychelles standards. I couldn't help but feel that that the management are missing some opportunities to make this into "the place" to stay and dine. It seemed fairly empty when I was staying. The restaurant rarely had more than one or two small parties at it whenever I went there. I was there for a friend's wedding and selected this hotel based on the bride's recommendation. The price is a bit steeper (as i was on a budget). However, the staff there is commendable. They are very generous sharing restaurants info and getting us a transport to go around. Robin (the evening shift guy) also helped me with retrieving my charger and ipod which i accidentally left behind. The manager and other staff crew are also very friendly and helpful. I also like that the apartment is fully-equipped with utensils we can use to prepare breakfast with. Will definitely recommend this if you're here for a trip. I would suggest the following: 1) the geyser went off at night on 1 of the days it was the entire complex, there is no standby call out to rectify, it was only attended to at 09h00 the next morning. what a wonderful holiday my son, age 12 and I had whilst staying at the Grand Bay Suites. I will highly recommend the suites for both families or couples. Our apartment had everything we needed and was amazingly comfortable in every way. It was cleaned to a high standard daily. Our laundry was done each day if needed. All the staff, from management to security and cleaning staff were super helpful and friendly. The location was perfect to beautiful beaches, great restaurants, bus stop etc. There is a fantastic supermarket just down stairs where you can buy everything you need and more. It was a very secure and safe environment too. Tours could be arranged for you at ease if required. We made some great friends with out her guests too who were staying in the Suites. We would highly recommend The Grand Bay Suitesgrand and hope to be back soon. Thank you for the wonderful, relaxing two weeks. Our stay was faultless with a warm welcome from the staff; towels were changed every day and the bed was made every second day. The pool was clean and the room was very nice and tidy.Supermarket next door and 10 minutes walk to centre of Grand Baie with restaurants and shops. Ample parking outside. I will recommend this place to my friends and all others. You cannot beat it for value. It was very quiet considering it is only off the main road. We will be back for another visit. We stayed for one week and arrived early so was checking in by the security. Eveything went smoothly and were escorted to our room which overlooked the garden and pool. Facilities were great and there is a supermarket next door to stock up. Other guests were polite and respectful and were a mixture of young families, couples, groups as well as solo travellers. Fun was had by all and would definitely recommend to friends and stay again. The staff was amazing welcoming polite and kind. 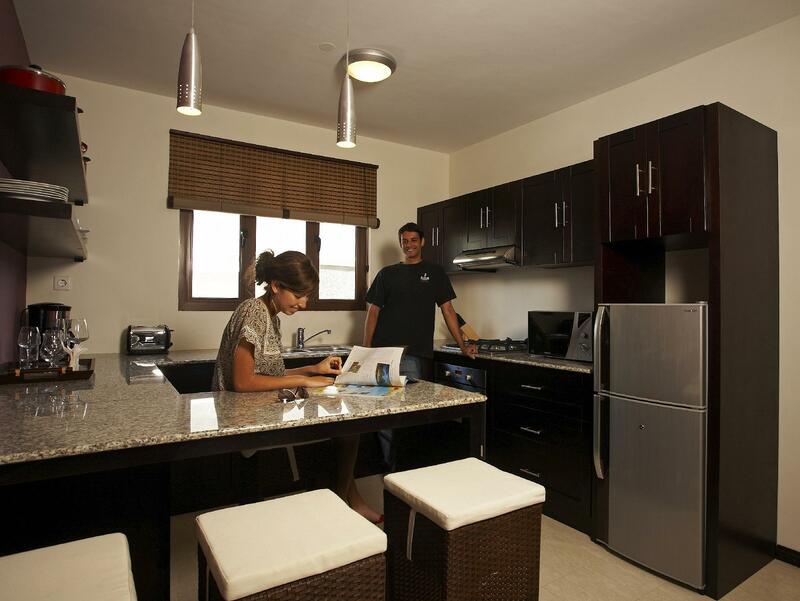 The apartment was clean up to date and fully equipped walking distance to la covete beach. We had a great stay at Grand Baie suites. The staff was helpful,kind,and professional. The apratment itself was fully equipped spotless clean and the daily maid service was excellent. They even did our dishes every morning. If you look for a place that you cook your own food (we did..) and feel at home away from home that's the spot for you. Great value for money. Superb experience - please be aware that there is a guy called Ragmatullah who claims to run the hotel - he is lying - he but merely sells site seeing tours around the island - he was very upset when we did not book via him and displayed a very bad attitude - he is also expensive - rather go to the main road, ask anybody for Haliemah from Northview Tours - very nice and efficient lady - her prices are great. 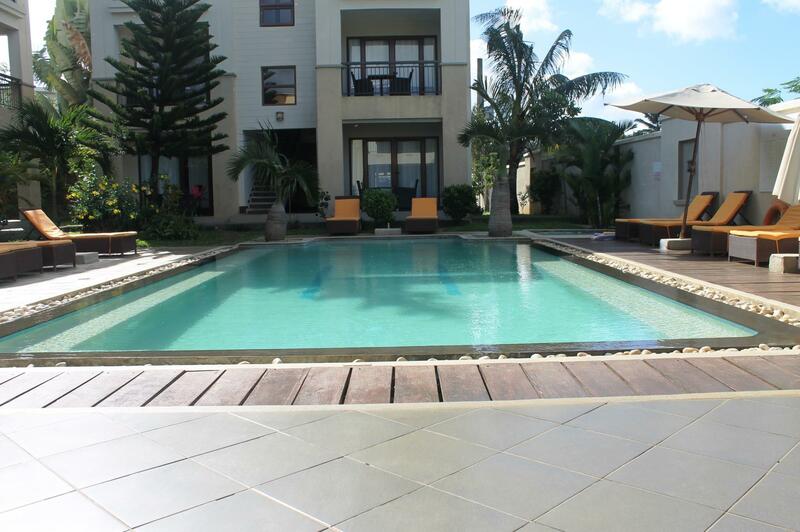 You can't go wrong with this self-catering apartment. Modern and well-maintained, with very pleasant staff. 10-15 minutes walk from town or the beach, but plenty of restaurants. No bars, as such, but would recommend the Cocoloco (a litre of beer is about $8), and the pizzas are good. The Beach bar has the cheapest beer, but is a futher 10 minutes walk down the road, and pretty miserable staff. Although, next door is an excellent bar/restaurant, with ocean views and friendly staff. Friendly staff, supermarket next door, public transport route and public beach within walking distance. Wonderful experience,excellent staff. Well stocked supermarket Store 2000 next door. Note supermarkets and shops close early on Sundays. Nice local restaurants in walking distance, and if you enjoy fish - you can buy fresh fish daily from local fishing boats close to Sunset Boulevard from 14h00 until 17h00 every day. We booked this suite for 7 nights and was quite pleased with the value for money of these apartments. Pros were that the suite was spacious and modern with a full kitchen. The security guards and staff on reception were very welcoming and the pool was clean with nice deck chairs for sun baking. Cons were the view from our balcony looked onto a wall and a run down car park. The apartment was tidy but not super clean with smudge marks in bathrooms and kitchen, etc. Wi-fi was very temperamental. I would recommend these suites for traveler's who are on a budget but still want a bit of luxury. Great staff, good location. Recommended.